자칭 자기 혼자만 신부라고 하는 엄수인의 주장 이것이 사실인지 그 의 주장하는 성경절을 읽어보자. 이 문제가 틀리면 그가 주장하는 모든 말은 다 잘못된 줄 알아야 하겠다. 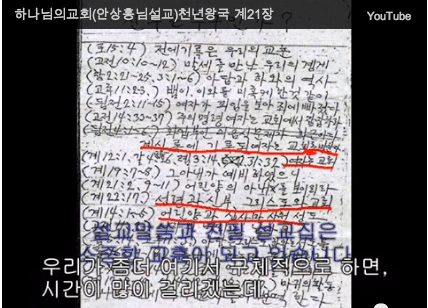 엄수인의 말하는 성경절은 (계 22장 17절) 이다. To verify UhmSooIn’s self-claim as the only Bride, we need to read the Bible verses used in her claims. If this problem turns out to be wrong then we must think that all of her claims are false. The verse that UhmSooIn used comes from Revelation 22:17. “성령과 신부가 말씀하시기를 오라 하시는도다” 하였는바 이 신부 가 엄수인 자신이라고 말하고 또 (계 21장 3절) “내가 들으니 보좌에서 큰 음성이 나서 가로되” 한 그 음성도 엄수인 자신이라고 하니 참으로 놀라지 않을 수 없다. It is written “The Spirit and the bride say, ‘Come!’” where UhmSooIn says the bride is herself and again saying (Revelation 21:3), “And I heard a loud voice from the throne saying” where she claims that the voice is hers and this is truly shocking. 하나님의 보좌 (옥좌) 는 하나님만이 좌정해 계시는 곳이고 그의 우편에 는 어린 양이 계시는 곳이다. 보좌에서 큰 음성이 나는 것은 하나님이나 어린 양 밖에는 아무 다른 이는 할 수 없는 일이다. 그런데 방자하게도 엄수인이 자기가 큰 음성을 냈다고 하는 것은 보통 정신병자가 아닙니다. God’s throne is where only God resides and the Lamb is at the right hand of God. The loud voice from the throne has to come from God or the Lamb and no one else. However, UhmSooIn’s corrupted claim of the voice being hers shows that she is a psychopath. 엄수인 발행한 책 …… 22-23p에 이런 방자한 말을 썼다. In the book that was published by UhmSooIn …… she wrote these corrupted words on pg. 22-23. 그러면 문제의 신부에 대하여 성경절을 찾아보기로 하자. Let’s explore the verses that relate to the problem of the bride. 기록된바 “성령과 신부가 말씀하시기를” (계 22장 17절) 여기 신부는 (계 21장 9-10절) 의 신부와 같은 신부인 것만은 사실이다. “신부 곧 어린 양의 아내를 네게 보이리라” 하였으니 어린 양의 아내는 성도들이다. (계 19장 7-8절) 을 보면 “어린 양의 혼인 기약이 이르렀고 그 아내가 예비하였으니 그에게 허락하사 빛나고 깨끗한 세마포를 입게 하셨은즉 이 세마포는 성도들의 옳은 행실이로다” 공동번역에는 “그분의 신부는 몸단장을 끝냈고 하나님의 허락으로 빛나고 깨끗한 모시옷을 입게 되었다 이 고운 모시옷은 성도들의 올바른 행위이다” 하였다. 그런고로 그 신부는 (계 21장 9-10절) 의 예언과 같이 하늘에 새 예루살렘을 말하는 것이고 새 예루살렘은 곧 144,000 성도들을 말하는 것이다. Therefore, according to the prophecy in Revelation 21:9-10, the bride is the heavenly Jerusalem and the New Jerusalem is 144,000 saints. 144,000 saints are all bride and the bride is the New Jerusalem. In other words, the New Jerusalem is God’s tabernacle (see Revelation 21:3) and this tabernacle was provided by the Lord 1900 years ago (see Hebrews 8:1-2). 이 장막 (새 예루살렘성 계 21장 3절, 9-10절 참고) 이 지상으로 내려오는 때는 이 세상이 끝나고 1000년이 지나서 되는 일이다. 기록된바 “또 내가 새 하늘과 새 땅을 보니 처음 하늘과 처음 땅이 없어졌고 바다도 다시 있지 않더라” (계 21장 1절) 하였다. The time that the tabernacle (New Jerusalem see Revelation 21:3, 9-10) comes down is 1000 years after the end of the world. It is written, “Then I saw ‘a new heaven and a new earth,’ for the first heaven and the first earth had passed away, and there was no longer any sea.” (Revelation 21:1). 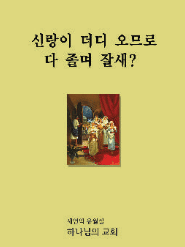 (계 20장 1-15절) 을 계속해서 자세히 보시면 세상이 끝나고 1천년 후에 되는 예언이다. 그런데 엄수인은 (계 21장 1-10절) 의 예언을 오늘날 자기가 큰 음성으로 하는 것으로 자기 발행책 22-23p에 방자하게 기록하고 있다. 이런 참람한 행위가 또 어디 있겠습니까? If we take a closer look at Revelation 20:1-15, it is a prophecy about 1000 years after the end of the world. However, UhmSooIn records in her book (pg. 22-23) that the prophecy in Revelation 21:1-10 is about her loud voice. Where would you find another presumptuous act like this? (계 20장, 21장, 22장) 은 천년왕국 후 되는 일이니 이점 특별히 주의하셔야 하겠습니다. (계 21장 1절) “새 하늘과 새 땅” 은 (벧후 3장 6-13절) 까지 읽어보시면 새 하늘과 새 땅이 나온다. Revelation chapters 20, 21, and 22 talk about the events after the millennial kingdom so this point needs to be taken especially cautiously. (Revelation 21:1) “A new heaven and new earth” is recorded in 2 Peter 3:6-13. “그 날에 하늘이 불에 타서 풀어지고 체질이 뜨거운 불에 녹아지려니와 우리는 그의 약속대로 의에 거하는바 새 하늘과 새 땅을 바라보도다” 하였다. 그런고로 (계 21장 1절) 새 하늘과 새 땅은 전세계가 불타버리고 1000년 왕국이 지난 후에 되는 일이다. Therefore, the new heaven and earth in Revelation 21:1 will happen after the world is destroyed by fire and after 1000 years. wow thanks for this. ive been going on and off for almost three years. tough thing to find out u been worshiping a korean lady…. Thanks for setting things straight. They are trying there best to get me baptised in their church and they recon everything will be revealed to me through the holy spirit. Never realized they think the end of the world is going to happen in 2012. It is the 22nd of December as I write this. Hold on to your purse. Tight. Thank jesus christ that we see the light, The New Jerusalem is our heavenly home, lol not a person, this false claim has people sounding wacko thank you God Jesus Christ our savior for revealing this to us and avoiding extrwme punishment.